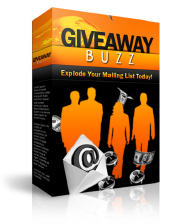 "Easily Create And Manage Giveaway Events & Explode Your Mailing List With This Giveaway Manager Software!" Easily create a professional giveaway event without having to worry about technical issues such as tracking of clicks, subscribers etc. Increase your profits made at your giveaway by simply offering an irresistible one-time offer! Effectively track and monitor your giveaway's activities and identify the partner who is delivering you results in both sales and visitors.